These are my KS3 resources (for students aged 11-14), added to as and when I make them. These are resources that are not specific to any topic and can be easily adapted. 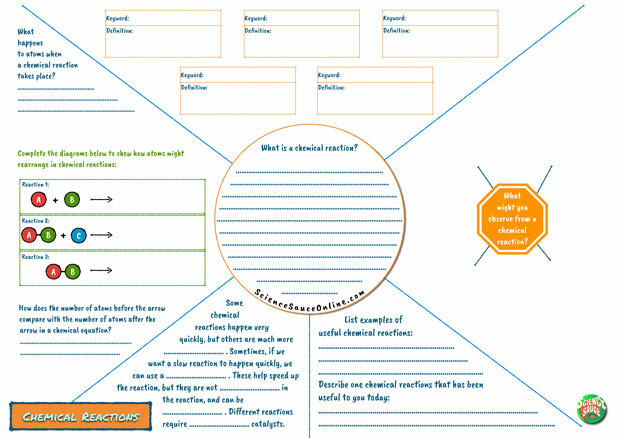 Funnel diagrams are arranged in a way that students complete the tasks outside of the central circle first, while the teacher is covering the content. After that, the students must answer the central question independently. This "What if..." worksheet is a great chapter review for the unit on forces. I got the idea from @iteachboys92 on Twitter. Students write a newspaper article based on the hypothetical situation, and have to use as many keywords as possible. This is a good differentiated task as it's accessible to all students; there are basic words as well as some more difficult ones that will stretch the upper ability students.